What a hairy situation. Well over a dozen glam bands gathered in Baltimore on May 30 for the inaugural M3 festival. Twisted Sister, RATT, Extreme, Kix, Dokken, Slaughter, Y&T, Gilby Clarke, Keel, Jetboy, L.A. Guns, Jani Lane, XYZ, BulletBoys, Carmine Appice's SLAMM and Steel Panther wowed the large and very drunk crowd. "Every hair band is here!" boomed Twisted Sister lead singer Dee Snider during the band's headline set. "Ok, every hair band except for Bang Tango!" M3, held at Merriweather Post Pavilion, featured two stages with back to back scheduling. No time gaps meant bands were playing constantly with fans running to keep up. Jani Lane was accompanied by guitar extraordinaire Keri Kelli for a set of classic Warrant tunes (think "Cherry Pie") and a brand new song called "Changes." Jani ranted in between songs and made the declaration that he is, in fact, Warrant. Kix and Baltimore go hand in hand and no band of the day drew a bigger crowd. Lead singer Steve Whiteman jumped his way through an hour-long set of classics including "Same Jane," "The Itch" and "Cold Shower." Choreographed moves helped the band along and made the girls squeal with delight. "We had a blast playing in front of the hometown crowd – it was an awesome sight that everyone came out to see us," says Kix bassist Mark Schenker. 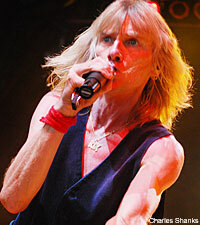 Whiteman made references to the band's local popularity: many in the crowd admitted attending M3 just to see Kix. Perhaps most surprising was Steel Panther, the glam parody act that proves you don't have to actually be from the 80s to love hair metal. Easily producing the biggest side stage crowd of the event, Steel Panther mixes comedy with metal, easily transitioning between songs like "Death to All But Metal" to burlesque and self-deprecating humor. Beautiful weather and pricey margaritas helped the day turn to night and eventually fans were chanting for both RATT and Twisted Sister. The big news of the day came when guitarist John Corabi appeared on stage with RATT. The former RATT member recently left the band to pursue other projects but stepped back in when replacement Carlos Cavazo had other commitments. "I Wanna Rock!" So goes the famous Twisted Sister battle cry and 80s rock anthem. Dressed as aging drag queens (the band's own words!) Dee Snider and the rest of Twisted proceeded to pound the festival crowd with "Burn in Hell," "We're Not Gonna Take It" and "The Kids are Back." Pass the Aqua Net.